One of the largest NGOs in Germany, Islamic Community Milli Gorus or IGMG, organized continent-wide protests in Europe at Chinese embassies on Saturday. It was the largest protest against cruelty of communist Chinese regime on Uyghur Muslims and western media which has widely covered Uyghur issue gave no coverage to Saturday’s protests. 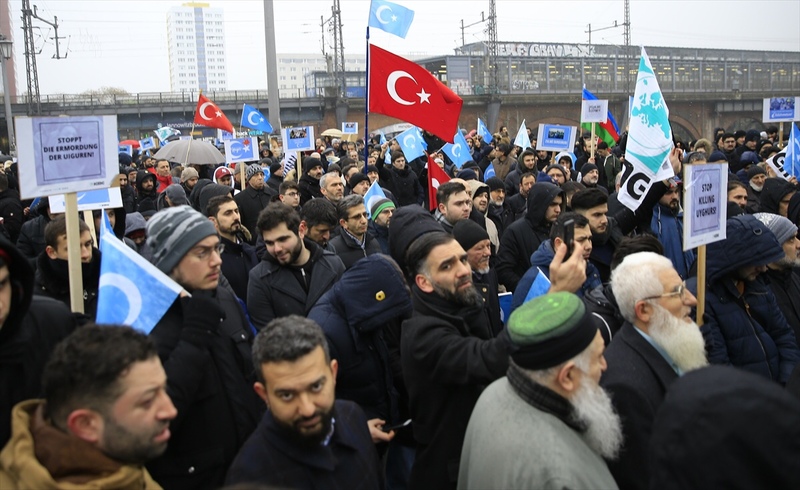 IGMG protest took place in Dusseldorf and Hamburg in Germany and thousands of people, mostly Turks, turned up to condemn Chinese crackdown on ethnic Uyghur Turks. Head of IGMG, Kemal Ergun, took the stage in Dusseldorf to call on the world to do more for the oppressed Uyghur Muslims. Western media, surprisingly, has been widely covering the Uyghur issue since infamous Chinese interment camps and other brutal assimilating policies came to the attention of the public, mostly through Uyghur activists. However, there was no western media attention when the largest protests yet against China took place through out the continent Europe on Saturday. Take up European Union-project multi-lingual network Euronews, for example. Its Turkish service has been extensively covering the Uyghur issue and Uyghur news has always turned out to be the most shared of its contents. However, Euronews Turkish provided no coverage for Saturday’s protests. “Every country, every network has their own agenda when it comes to Uyghurs,” says Mihriban Mehmed, an ethnic Uyghur living in Germany. She thinks similar policies would found no place in the western media if the subject country were not China. “Some circles abuse Uyghur suffering for their own cause. They like to attack Turkish government for example for its silence on Uyghur issue,” says another Uyghur man who chose to remain anonymous out of fear. He says for that reason, Ankara government needs to speak up against China. Turkish state-affiliated networks also ignored the Saturday’s event. State-owned TRT’s 24-hour english channel runs news about Uyghur suffering from time to time. Chinese government has dual crackdown on ethnic Uyghurs. While it has been implementing assimilation policies on one hand, Beijing also tries to take Islam under its total control. Images of long-bearded Uyghur men printed in the western newspapers as the oppressed Muslims of Chinese regime, while same images from other countries would only represent terrorism related figures in the very same newspapers. While the German media heavily criticizes Chinese government’s policies on Islam, they hail similar policies of their own government.